And the travel gods looked upon the Midwest. Indiana to Illinois, it seemed so simple, the capital city of one state to another. Indianapolis to Springfield is but 191 miles along the I-74 W and I-72 W, a map smidge to the west. It started off well enough. 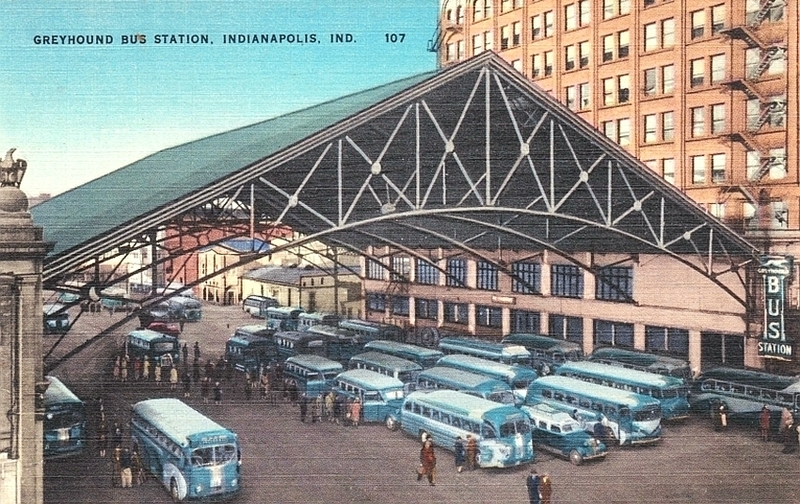 The Greyhound bus departed Indianapolis at 12:50 p.m. (EST) and arrived at 2:10 p.m. (CST) in Champaign, Illinois, on time. The connecting bus was supposed to depart at 6:00 p.m. and arrive at 8:00 p.m. (CST) in Springfield, well in time for a night out in the charming Land of Lincoln. But the bus was late, oh so late. The wait put the customer service agent in an awkward position with the passengers. Emotions ran high. Complaints were rampant. I believe there was yelling and at least one Cry Face. The agent had no contact with the incoming driver and precious little information to share. The driver would pull our bus into the terminal in Champaign, and subsequently into the terminal in Springfield, at midnight, four hours late. There would be no explanation for the serious delay. He was short with passengers, but focused on our safe arrival. Well, the worst was over. I would visit with old friends, pay my respects to Abraham Lincoln in his museum and most of all eat and drink my heart to my heart’s content in old Springfield (est. 1821). But the travel gods of the Midwest would let me go, just yet. The bus was to depart at 2:40 p.m. (CST) from Springfield, but the station was closed. A friend drove me to the station, where we mostly waited in his car to mind the rain. The schedule was written in black marker and scotch taped to the door. The bus it indicated would come, did not. We stuck around for about two hours, before calling it quits. When I called the 1-800 customer service line, the agent informed me she was based in Dallas, and that information on delays and cancellations takes 24 hours to show up on her computer. “No delays or problems showing on my computer,” she repeated, which equated to reporting on the state of my bus one yesterday ago. Time travel is apparently useful in the Greyhound dimension. The travel gods were laughing. I twice asked to speak to the supervisor, and twice she put me through to automatic voice mail. This does makes sense. To hold a managerial position at this company would likely mean talking to angry passengers often, i.e. if one took customer service seriously. “I don’t know why you’re being so rude, sir,” said the last Greyhound customer service representative that spoke to me. I disputed the credit charges for each ticket, for the no show bus and the bus that was four hours late. MasterCard refunded both amounts. Greyhound posed no challenge. Whether that suggests indifference, disorganization, or suggests a concession of failed service, I don’t know. One gets the distinct impression that this type of thing happens all of the time. After a couple minutes on hold, I spoke to an Amtrak customer service agent, who called me “dear” and sounded like a Grandma. She reserved my tickets right away. 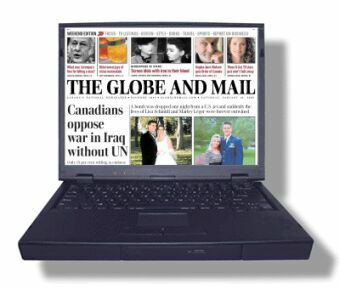 I didn’t have to print them at home or in an internet cafe. They would be waiting at the Amtrak desk of the Springfield station. The train is a glorious respite from the oft-cramped way of bus-travel. Springfield up to Bloomington-Normal, Illinois, is a little out of the way. But it was a smooth glide with leg room. It is a shame there is no direct train between Springfield and Indianapolis. 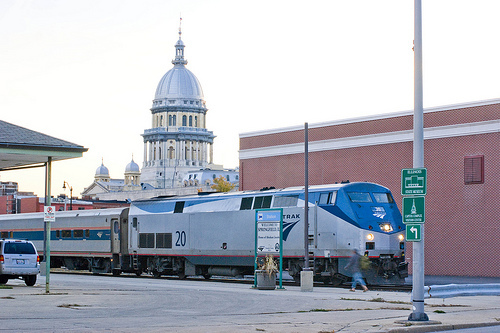 The Amtrak train arrived in Springfield about 20 minutes late, to take me to Bloomington-Normal and to my connecting Amtrak bus, which arrived about 40 minutes late, still a clear upgrade on Greyhound. She prevented a smoker from getting off the bus during a drop-off/ pick-up. Despite starting 40 minutes behind, she made up time, getting us over to Indianapolis about 20 minutes late. She provided comedy on the mic: “You must have all eaten too much at the last stop because I can’t get up to speed” for the formerly hungry and bottled water for the thirsty. The Amtrak driver was all-business and funny. Amtrak is best known for its trains, but don’t assume each leg of your voyage will be by train. This I learned years ago, after watching my first Amtrak bus drive away. Amtrak is slightly more expensive than Greyhound. A first class ticket for Indianapolis to Springfield with amenities: food, drink and wheelchair accessibility on the Texas Eagle bus costs $74.00. One can also go with the Lincoln Service without amenities for $41.00. Greyhound is normally cheaper, ranging from $48.60 Monday to Thursday and $53.10 Friday thru Sunday. May the travel gods of the Midwest be with you. Gallery | This entry was posted in Bloomington-Normal, Champaign, Illinois, Indiana, Indianapolis, Springfield. Bookmark the permalink.